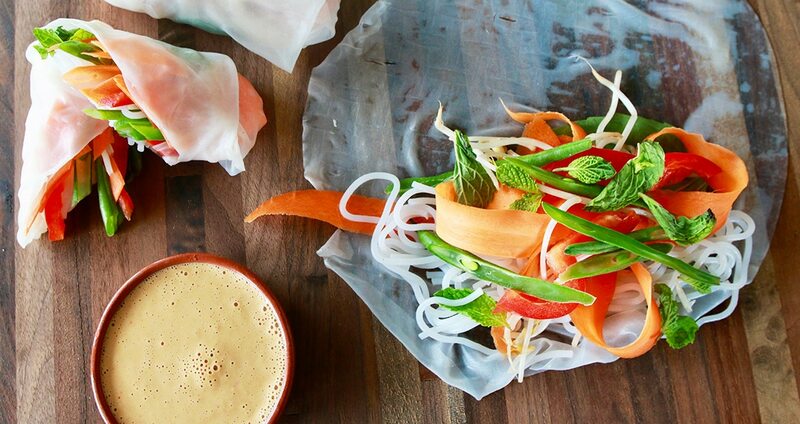 Salad rolls, also known as fresh rolls, spring rolls or Vietnamese rice-paper rolls, are a wonderful appetizer or light meal that packs a rainbow of fresh vegetables into a thin rice-paper wrapper. The options are endless—experiment with your own fillings, such as shrimp, cooked chicken or even nontraditional combinations like sliced turkey and apple. These are best enjoyed the day they’re made, but you can prep the day ahead for a grab-and-go lunch by storing the rolls in an airtight container with a wet paper towel. Lightly wet the surface that you will be working on. Remove one rice-paper wrapper and soak in warm water for about 5 seconds, let drain briefly, and lay it out flat (these are very delicate and break easily, so work very slowly and gently to spread out your wrapper). At one end, layer your noodles, herbs and vegetables; then (like a burrito) tightly fold the short end over the vegetables, tuck in the sides, and continue rolling over the rest of the length of the wrapper. The rolls will seal as they dry, and the method takes patience—so remember to take some deep breaths and enjoy yourself. If your roll tears, feel free to layer it onto another rice-paper wrapper. Even if they look strange, they’ll still be delicious! Serve with peanut sauce, below. In a blender, combine nut butter, kimchi, maple syrup, soy sauce, lime juice and sesame oil and blend until evenly combined. Use as is for a dip, or thin with warm water, ¼ cup at a time, until mixture reaches desired consistency.